Hollywood has the Academy Awards. 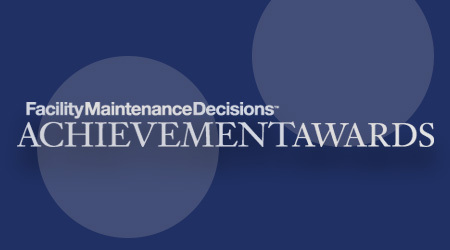 Maintenance and engineering departments have the Facility Maintenance Decisions Achievement Awards. As a bonus, receiving an award does not require long, boring speeches. In their seventh year, the awards shine a spotlight on the value of maintenance and engineering departments in institutional and commercial facilities. The awards are a chance for departments to earn a well-deserved pat on the back. Financial Management, including capital and operating budgeting and notable project savings, and product specification. Sustainability, including water conservation, energy efficiency, green purchasing, and recycling. Personnel Management, including recruiting, training, retention, and outsourcing. The contest is free and easy to enter. Submit your entries here, and visit www.facilitiesnet.com/fmd/fmdaa for more information. Good luck from the editors of Facility Maintenance Decisions. We look forward to reading about all the fruits from your department’s labors.